An incredible battle ensued in the GT Class between Corvette and Porsche that ended with Corvette winning first and second place in the GT Le Mans class in the 54th Rolex 24 at Daytona. 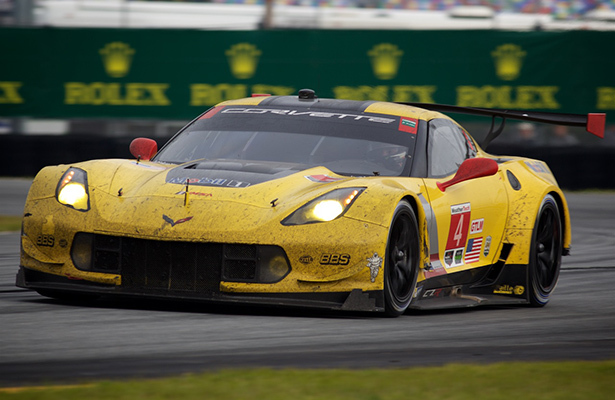 After 24 hours of racing the two Corvette C7.Rs breezed across the finish line separated by only 0.034 of a second with Oliver Gavin taking first and Antonio Garcia at the checkered flag. Both Corvettes ran a problem-free race for the first 23 hours and 45 minutes, and ended up dueling it out between teammates for the final fifteen minutes of the race. However the No. 912 Porsche 911 RSR, driven by Earl Bamber was hot on the heels of the Number 4 Corvette being driven by Oliver Gavin as Gavin made an incredibly daring pass by Bamber’s Porsche at the West Horseshoe section of the track. On the final lap of the race, Antonio Garcia made one last attempt to pass Oliver Gavin but came up just 0.034 of a second short resulting in an incredible 1-2 finish for Corvette.